Dirt on The Rocks is a new bi-monthly blog for The Rocks. Each update you’ll be able to get an in-depth insight into a museum artefact, exhibit or a recent archaeological discovery in The Rocks. 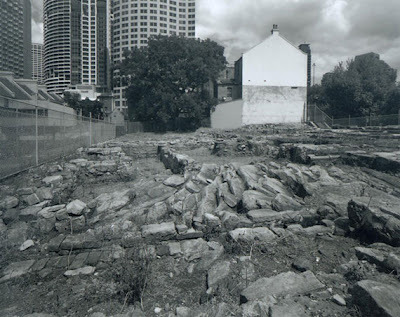 This post, the first of many, focuses on an archaeological site on Cumberland Street. 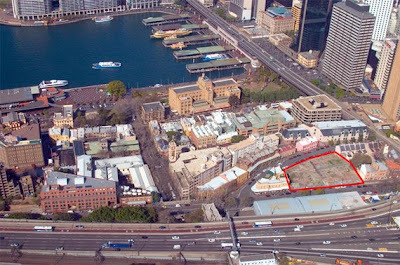 In November 2009, Youth Hostels Australia (YHA) opened their latest hostel in at 110 Cumberland Street, The Rocks on the site of an archaeological excavation with remnants of more than 30 convict buildings dating back to the 1790s. 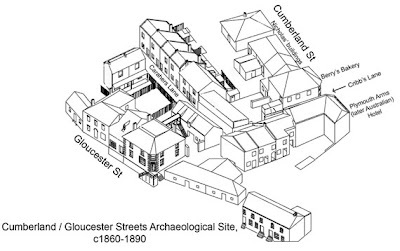 In a unique partnership, this site bordered by Cumberland and Gloucester Streets was released to YHA for 100 years, on the proviso exposed archaeological remains would be conserved and open for viewing by the public. The site had been open space since the demolition of a large shed in the 1930s. The shed, an engineering workshop built in 1917, had itself taken the place of some 30 houses and shops, the earliest built in 1795, which were demolished around 1900. The people who lived on the shores of the harbour were the Cadigal, a clan of what were known as the Eora, or coastal Darug, people. To them the end point of this peninsula was Tarra, and the cove to its east Warrang. These people ranged over the harbour from the coast inland to the bay that is now known as Darling Harbour. No remains of the Cadigal’s presence were found on this site. The ruggedness of the sandstone no doubt made it a fairly hostile and exposed place. The soils here were thin, supporting shrubs and small trees clinging to the crevices in the rock. With the arrival of the Europeans the landscape was cut, terraced and drained, in all likelihood destroying evidence of earlier occupation. The Rocks quickly became home to many convicts who set about transforming the rugged landscape - initially setting up temporary tents and huts. Tracks led up from the harbour. One of these, Cribbs Lane passed through the site pre-dating Cumberland and Gloucester Streets - part of the regularised street pattern created in 1810. Ann Armsden and her First Fleeter husband, George Legg, first built a house on the site around 1795. Following George’s death in a boating accident on the harbour in 1807, Ann married her neighbour, baker George Talbot and rebuilt their house in stone. Irish rebel, Richard Byrne, lived here from around 1805. Byrne was a stonemason, and may have been responsible for some of the quarrying for his neighbours’ houses. One pre-1820s quarry can still be seen, and it is most likely houses here were constructed from materials from the site. For fresh water a number of wells were cut into the rock. A well dug by the Byrne family has a few steps cut into the sandstone leading to it. It was here, or a similar well in Cumberland Street, that a small child drowned in 1810. The Byrne family remained here until the 1850s. Their descendants can still be found living in The Rocks area. George Cribb, also a convict, lived on the site from 1809 to the late 1820s. George was typical of many of the early convicts who prospered in the new colony. He was a butcher, and though working for the government as part of his sentence, in his own time he slaughtered cattle, sheep and pigs sold as meat both within the colony and to ships leaving Sydney. His slaughterhouse was in the centre of his property. George brought soil in, and buried the discarded skulls, horns and limbs of his animals here. Thousands of animal bones were found, relating to George’s work and tell us much about the cuts of meat enjoyed by the people of Sydney. 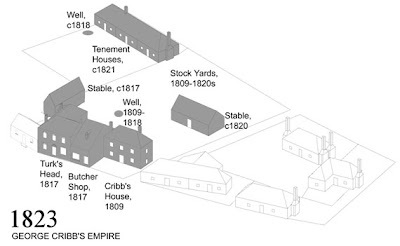 As Cribb’s fortunes grew, he built and rented out a row of four tenements. In 1817, following his marriage to widowed publican Sophia Lett, he built a butcher shop and a hotel, the Turk’s Head. Around this time, George filled in his well with household “rubbish” including fine hand-painted Chinese porcelain and a butcher’s filleting knife. For some time, George had been under surveillance by the authorities for suspicion of dealing in illegally produced alcohol. Although arrested, no evidence could be found to convict him. 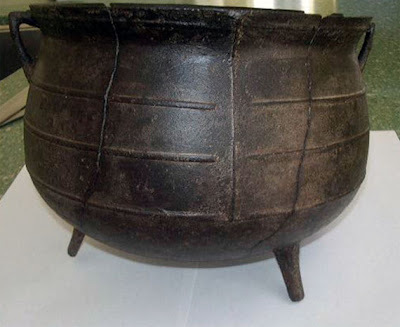 Among the items found in the well, however, was a small ceramic and tin ware still. By the late 1820s George found himself in financial difficulties and his property was purchased by land speculators Raine & Ramsay. They subdivided it in the 1830s, creating Carahers Lane to provide access between Cribbs Lane and Longs Lane to the south. In 1830 Cribbs’ house was enlarged and became the Whalers Arms pub, a two storey stone building with stables at the back. 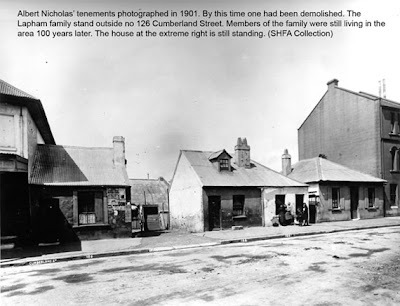 Albert Nicholas bought the land on Cumberland Street and built five cottages over the former quarry. On Carahers Lane six two-storey terraces were built, with three more on Cribbs Lane. Over the next 70 years these, and other houses on the site, were occupied by immigrants and their families, originating from Ireland, England, Scandinavia, Portugal and other parts of Europe. The Byrne family sold off their land bit by bit in the 1840s and 50s. At the top of Cribbs Lane Robert Berry established his bakery in 1844. It was here the families of The Rocks often brought their Sunday roasts to be cooked in the baker’s ovens. On the other side of the Lane, Berry’s sister Jane and her husband Thomas Share operated a pub called the Plymouth Arms Inn, later renamed The Australian. Jane and Robert Berry’s younger brother John died as a result of an epileptic seizure at the bakery in 1844. His body was taken to the cellar of the Plymouth Arms where a coroner’s inquest was later held. 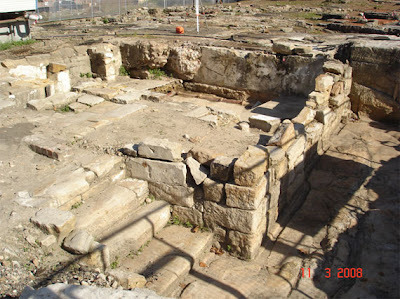 That same cellar was uncovered during archaeological work. 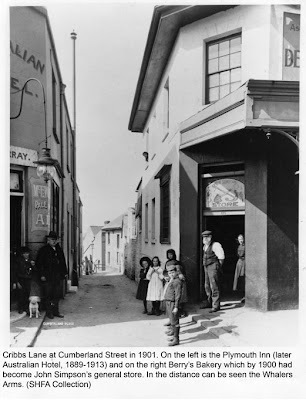 When the pub was demolished in 1913, a new Australian was built nearby and remains today. When the bubonic plague arrived in Sydney in 1900 it was thought the densely occupied Rocks would be hard hit. 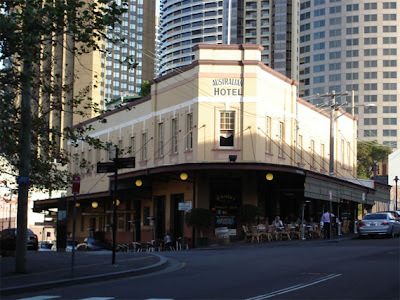 The Rocks had long been considered a “slum”, mainly because Sydney was spreading out into the suburbs and many no longer considered the old part of the city to be healthy. Water and the sewer had been connected from the 1850s; however negligent landlords had apparently allowed the systems to fall into disrepair. Likewise, some of the houses were poorly maintained. In many houses rubbish was disposed of under the floorboards. In this way up to 40 centimetres of rubbish accumulated. The rubbish discarded has told much about the inhabitants. They ate well; lamb, oysters, fish, chicken and duck, applied salad oils to salad and vegetables, added pickles and chutneys as side dishes and often ate off the finest bone china. The well near the Byrne family’s house was filled with household rubbish, including a 3-legged iron cooking pot. The insides of the houses were decorated with figurines, vases of flowers and often curios such as cowry shells and coral. The inhabitants adorned themselves with fashionable jewellery, sewed their own clothes by the light of the front and back doors, smoked clay pipes by the fireside, and the children played with dolls, miniature tea sets, marbles, toy soldiers, chess and dominoes. Despite the fear that the bubonic plague would have disastrous effects on the crowded district, only three people in The Rocks died. The total number of deaths in NSW was just over 100. One of those who died was a 15-year-old paperboy named James Foy. He lived in a terrace Cribbs Lane, but probably contracted the disease on the waterfront. The Rocks was condemned to demolition, and the area was bought up by the Government after 1901. Over the next 14 years the site was cleared, as were other parts of The Rocks. Of the people who lived here, some moved to the suburbs, others stayed nearby. Apart from the engineering shed here between 1917 and the 1930s, no other substantial buildings were built, preserving the archaeological remains. The book Inside The Rocks: The Archaeology of a Neighbourhood, by historian Dr Grace Karskens, is available from The Rocks Discovery Museum, Kendall Lane, The Rocks. What a great idea, i love this site. This so really interesting and shows clever use of historical information. I love this site too! I am wondering whether the Elizabeth cassidy publican at Gloucester street around 1814 for ten years is noted in the referencing of this famous area, The Rocks. NSW. This is just what is needed - giving history and a sense of past to a precinct that is becoming more and more commercial and hollowed out of its very real depth. thank you and i look forward to reading more history about specific sites and buildings. This is amazing, it really should be updated ! this is so interesting im drueling with excitement this is such an extravagant wsebsite and im so glad that i happened to stumble upon this!! !